The 5.45x39mm round is a rimless bottlenecked rifle round developed in the 1970s and designed by a group of Soviet engineers under the leadership of M. Sabelnikov. The 5.45x39mm round sees much use in AK-74 rifles, over time eventually essentially replacing the 7.62x39mm round. The 5.45x39mm cartridge was not originally intended for civilian use, but because of high demand, the 5.45x39mm round is being manufactured by many civilian companies today. The Armory stocks a wide range of 5.45x39mm ammunition to satisfy the needs of plinkers, hunters, competitive shooters, and the avid ammunition aficionado. 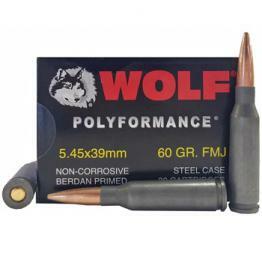 Being avid shooters ourselves, we enjoy trying out new 5.45x39mm ammunition and try to offer you 5.45x39mm ammunition at very aggressive prices so that you can share in our most favorite pastime.